This week we are showcasing projects created with our newest collections along with products from Pretty Pink Posh! Join us every day this week for inspiration projects from our fabulous design team! 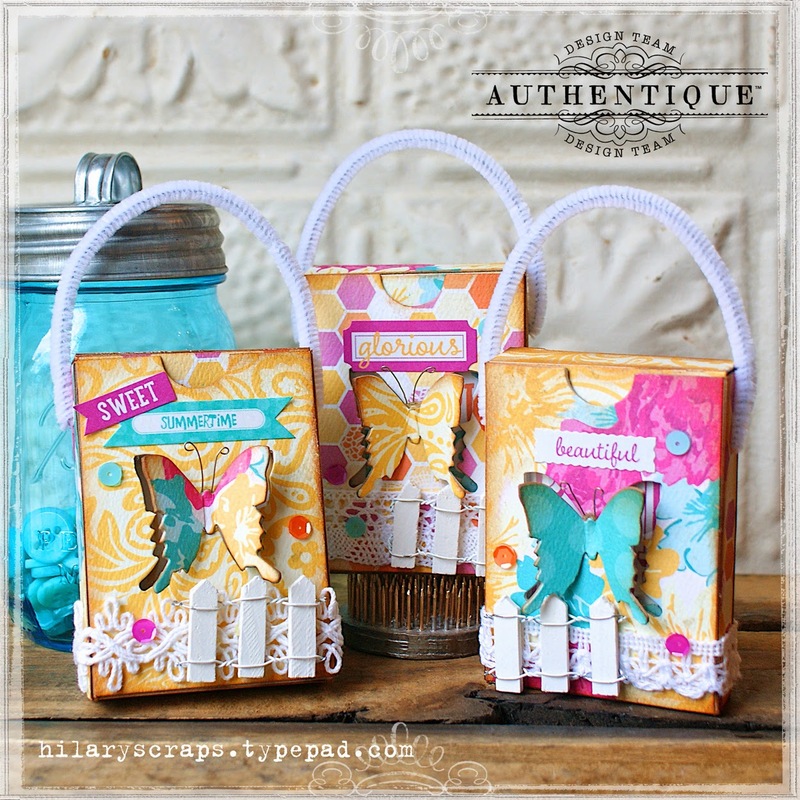 Hey everyone, it's Hilary here today with a fun little project using the "Radiant" collection by Authentique Paper, and some really sweet sequin from Pretty Pink Posh. For my project today, I created little mini-notecards, and fun boxes to hold them. I hope you enjoy! For the boxes, I used an 'Artist Trading Card' Sizzix die to cut the base out of chipboard and patterned paper, then used a small butterfly die to cut out a butterfly for the middle. Then folded and adhered the paper to the chipboard using a very strong permanent adhesive. For the bottom's of the boxes, I wrapped pretty crochet trims and a little snippet of a wooden fence, securing with hot glue. The center is clear by way of a small piece of transparency, which was sandwiched in between the pattern paper and chipboard. I added fun stickers to the top, some matching sequins from Pretty Pink Posh, and of course, little wire antennae to the butterflies. Before adhering the paper to the chipboard, adhere a small piece of transparency over the chipboard butterfly opening, then adhere your pattern paper on top, (now you have a small 'window')....Then, pinching the wings upward, secure the separate chipboard butterfly to the transparency using a dab of hot glue, after adding small wire antennae to the top. These little boxes are great for holding little gifts too, there's plenty of room for adding a small treat along with your notecard. I wanted to add a small carrying handle so a small white pipe cleaner was the perfect touch. The small little notecards inside measure 2 1/2 x 3 1/2 and I used the "Life Cards" for the fronts of the cards. The cards are super easy to make, simply cut white cardstock to 5 x 3 1/2, fold in half and set aside. Cut a piece of pattern paper slightly smaller and adhere to the white card. Cut out a "Life Card" and adhere to the front, and decorate with small sequin. I also added a sentiment sticker to the inside. I love how simple and fun these mini-notecards came out. 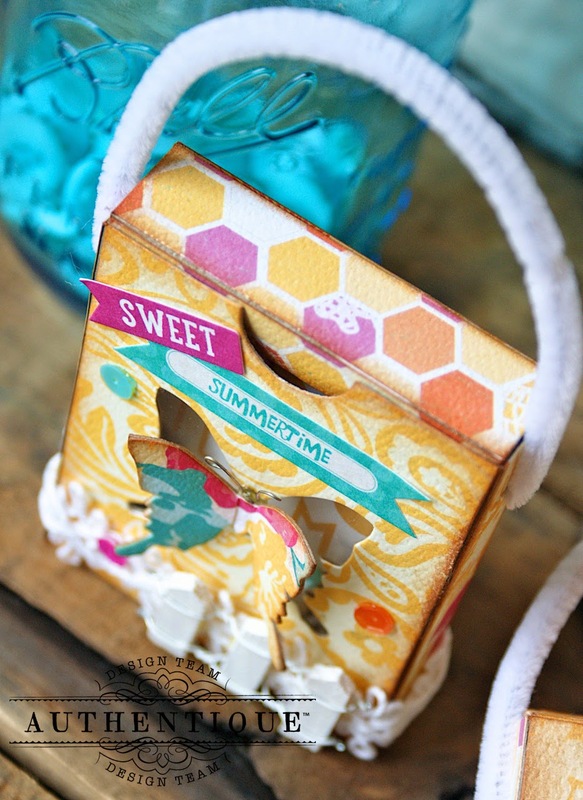 This whole project makes me smile and your recipient will surely love these as well. Thank you so much for stopping by today, I hope you enjoyed my project! chipboard, Sizzix dies: Artist Trading Card, Box, and Butterflies, distressing ink, Tombow Power Bond adhesive, (or another good permanent adhesive), hot glue, thin wire, transparency, small snippet of a wooden picket fence, crochet trim, and white pipe cleaner. Also, make sure you stop and visit us as well as our friends over at Pretty Pink Posh on Facebook and tell them Authentique Paper sent you! Love this idea. What great gifts they would make. These boxes and cards are so sweet! The paper is amazing and I love the butterfly cut-out! ADORABLE!! 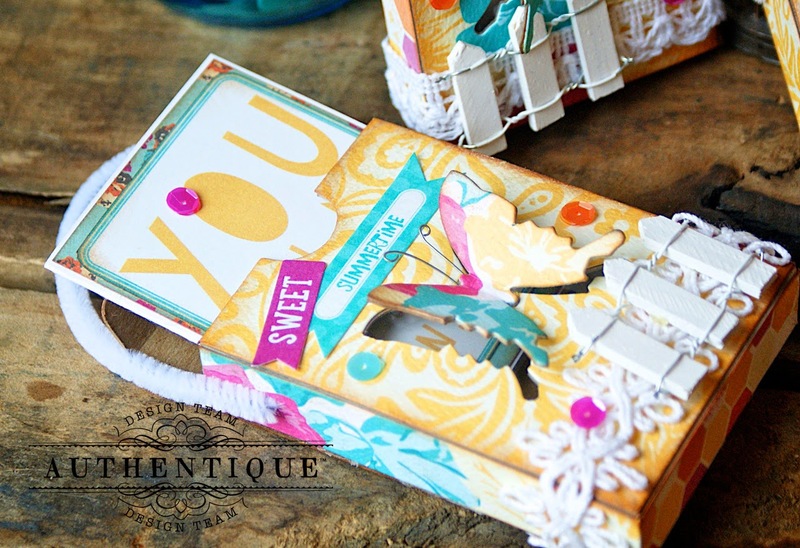 Love the fun colors and the sweet size of these little mini-notes!! Very cute box holders!! What an adorable little gift set! The colors and size are so cute and fun! The little boxes ar darling. Love the pipe-cleaner handles. Little gift boxes often hold big treasures. Thanks for showing us how to create something from the heart! The boxes look so cute and I love the vibrant colors. They are so fun, pretty and colourful! Just love them! What darling cards and treat boxes! It definitely puts a smile on my face! That is the cutest box ever! 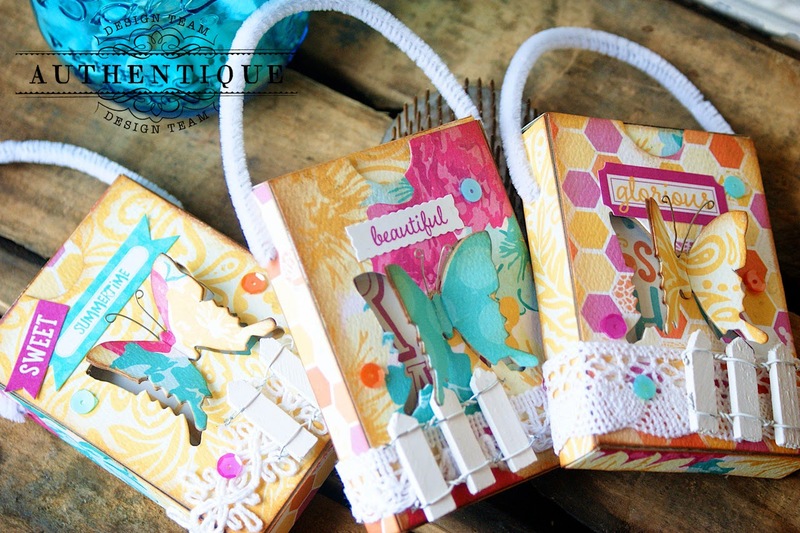 I love the beautiful cardstock and the popping butterfly. What a super fun project. These are just adorable! Great colors and details! Love the papers, butterflies, pieces of fence! And the fun PPP sequins in all the pretty colors too! Very pretty colors and I like the dimensional butterflies. Good golly, that fence is too stinkin cute! Loving those bright colors. Makes me think of popsicles. Love PPP and Authentique! What cute boxes! I love the vibrant colors and butterflies. I love this box of cards! These colors are so vibrant and this would make a great present idea for friends! 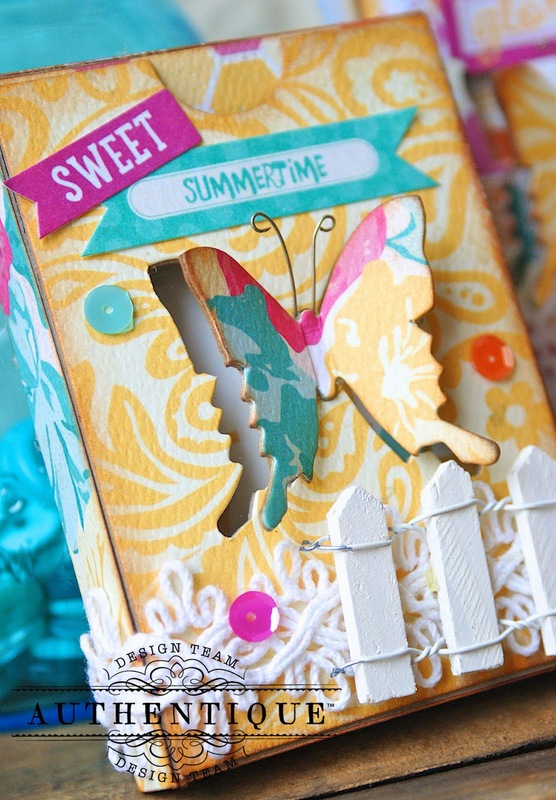 Stunning projects, who doesn't love butterflies and that adorable fence, love the scene created! A beautiful scene! The little wooden fence and the butterfly are like looking into Granny's garden! 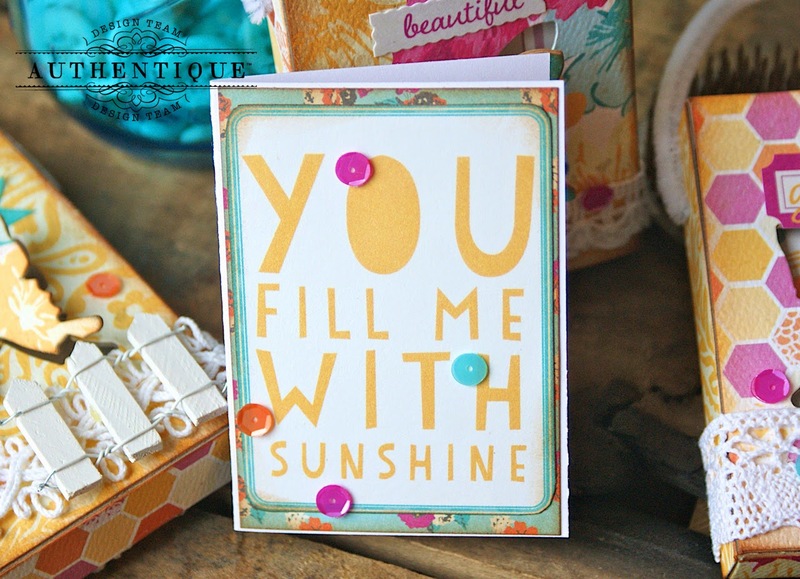 The little mini-notecards are wonderfully simple but so adorable. I really like the pipe cleaner idea for the box handles. Great job! How sweet! Love the butterfly! Such darling little note holders! The cards are so "Rad"!!! LOL! But those darling butterfly boxes are so adorable!!! Just love them! This is a fantastic idea. Thank you. Love the colors. Hilary, your boxes are ultra fabulous and I definitely enjoy them!!! 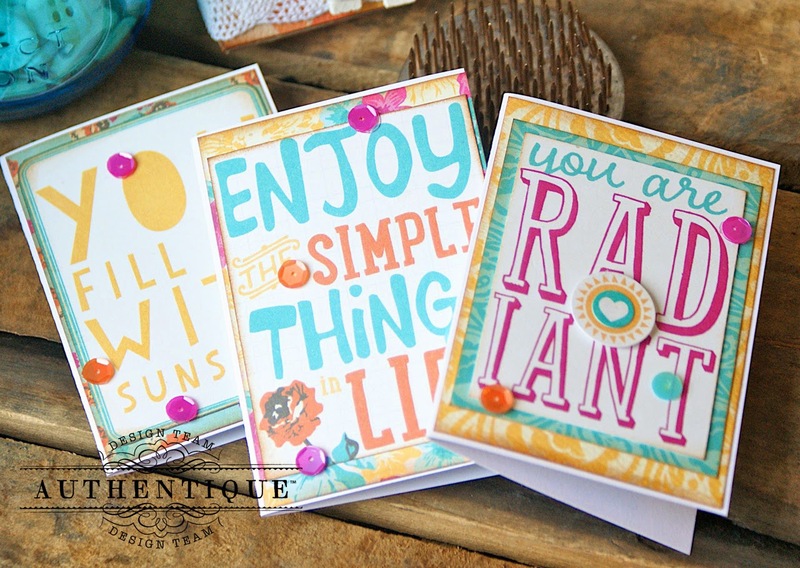 I love the Radiant collection and I really adore how you showcased it with this delightful presentation! The white picket fence is SO darling!!! I love that these are a great fit for small notecards, ATC's etc.! Awesome and inspiring you are!!! Thanks for sharing!! So gorgeous and original! Swoon!